The national motto is depicted by the four stars enshrined within the Coat of arms of Bangladesh. The national motto of Bolivia, La Unión es la Fuerza (Unity is Strength), is inscribed on the national currency. 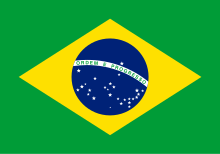 The national motto of Brazil, Ordem e progresso (Order and progress), is inscribed on the flag. The obverse of the French 1 euro coins displays the national motto, Liberté, égalité, fraternité (Liberty, equality, fraternity). The flag of Iraq displays the national motto, Allahu Akbar (Allah is Great). 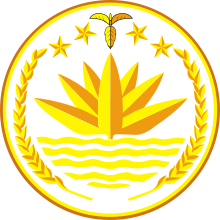 The motto of Kiribati, Te mauri, te raoi ao te tabomoa (Health, Peace and Prosperity), is shown on the coat of arms. The coat of arms of Pakistan displays the national motto, Iman, Ittihad, Tanzeem. (Urdu Unity, Faith, Discipline. The coat of arms of Panama displays the national motto, Pro mundi beneficio (Latin for For the benefit of the world). पेरू: Firme y feliz por la unión (Spanish, Steady and Happy for the Union)। Unofficial, used in the reverse of Peruvian sol coins. पोलैंड: No official motto. Among the unofficial ones Bóg, Honor, Ojczyzna (Polish, God, Honor, Fatherland)। See also Unofficial mottos of Poland. सर्बिया: Само Слога Србина Спасава (Serbian), "Only Unity Saves the Serbs". 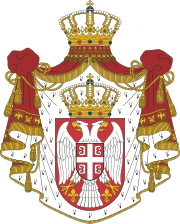 The inescutcheon stands for the Serbian Nation; in a red shield, a cross between four silver firesteels arranged in the quarters around it, all of them facing horizontally outwards. The four silver firesteels stands for the Serbian letters S (C); Само Слога Србина Спасава (Only Unity Saves the Serbs). ↑ "Caribbean Community (CARICOM) Secretariat - Antigua and Barbada". अभिगमन तिथि 2006-08-02. ↑ "Caribbean Community (CARICOM) Secretariat - The Bahamas". अभिगमन तिथि 2006-08-02. ↑ "Caribbean Community (CARICOM) Secretariat - Barbados". अभिगमन तिथि 2006-08-02. ↑ "Caribbean Community (CARICOM) Secretariat - Belize". अभिगमन तिथि 2006-08-02. ↑ "La Constitution de la République du Bénin". अभिगमन तिथि 2006-08-02. ↑ "The Government of Brunei Darussalam - National Flag and Crest". अभिगमन तिथि 2006-08-05. ↑ "About Bulgaria: National Symbols - Flag, coat of arms, anthem". अभिगमन तिथि 2006-08-05. ↑ "Constitution of Cambodia". अभिगमन तिथि 2006-08-05. ↑ "La Constitution du Cameroun (फ्रेंच)". अभिगमन तिथि 2006-08-05. ↑ "The Canada Encyclopedia: A Mari usque ad Mare". अभिगमन तिथि 2006-08-05. ↑ As shown on the coat of arms of Colombia. ↑ As shown on the Coat of arms of Comoros. ↑ As shown on the obverse of the coins; see "this photo of a 1992 coin". अभिगमन तिथि 2006-09-26. ↑ "Caribbean Community (CARICOM) Secretariat - Dominica". अभिगमन तिथि 2006-08-02. ↑ "Constitution of Equatorial Guinea". अभिगमन तिथि 2006-08-15. ↑ "Europa - The symbols of EU". अभिगमन तिथि 2006-08-15. ↑ "National Symbols) Fiji Government Online". अभिगमन तिथि 2006-08-02. ↑ "Constitution de la République Gabonaise" (PDF). अभिगमन तिथि 2008-01-19. ↑ "Seatle Gambia Association - Coat of Arms of The Gambia". अभिगमन तिथि 2006-08-15. ↑ "Republic of Ghana: The Ghana Coat of Arms". अभिगमन तिथि 2006-08-16. ↑ "Caribbean Community (CARICOM) Secretariat - Grenada". अभिगमन तिथि 2006-08-02. ↑ "Banco de Guatemala - Bills and Currency in Current Circulation". अभिगमन तिथि 2008-03-11. ↑ "Caribbean Community (CARICOM) Secretariat - Guyana". अभिगमन तिथि 2006-08-02. ↑ "Caribbean Community (CARICOM) Secretariat - Haiti". अभिगमन तिथि 2006-08-02. ↑ "National Portal of India : Know India : National Symbols". अभिगमन तिथि 2006-08-22. ↑ "Iranian Empire (Pahlavi dynasty): Imperial standards". अभिगमन तिथि 2007-05-03. ↑ "Laos - Foreign Investment Management Cabinet: Politics". अभिगमन तिथि 2006-08-22. ↑ "Lesotho Embassy in Washington - Lesotho Fact Sheet". अभिगमन तिथि 2006-08-22. ↑ "Liberian President Sirleaf Addresses Joint Session of Congress". अभिगमन तिथि 2006-08-22. ↑ "Luxembourg Tourist Office in London: Luxembourg - Small and Beautiful". अभिगमन तिथि 2006-08-22. ↑ "Government of Malaysia - Malaysian flag and crest". अभिगमन तिथि 2006-08-23. ↑ "The Republic of Mauritius Web Portal - Coat of Arms". अभिगमन तिथि 2006-08-27. ↑ "Namibia in a Nutshell - Symbols". मूल से 2006-08-20 को पुरालेखित. अभिगमन तिथि 2006-08-23. ↑ "The Dutch royal house: The royal coat of arms". अभिगमन तिथि 2006-08-02. ↑ "New Zealand Ministry for Culture and heritage - FAQ". अभिगमन तिथि 2008-03-11. ↑ Article 15 of the "Constitution of the Federal Republic of Nigeria". अभिगमन तिथि 2006-08-23. ↑ "Information of Pakistan: Basic Facts". अभिगमन तिथि 2006-08-02. ↑ Section 40 of "Republic Act No. 8491: An act prescribing the code of the national flag, anthem, motto, coat-of-arms and other heraldic items and devices of the Philippines" (DOC). अभिगमन तिथि 2006-08-27. ↑ "Caribbean Community (CARICOM) Secretariat - St. Kitts and Nevis". अभिगमन तिथि 2006-08-02. ↑ "Caribbean Community (CARICOM) Secretariat - Saint Lucia". अभिगमन तिथि 2006-08-02. ↑ "Caribbean Community (CARICOM) Secretariat - St. Vincent and the Grenadines". अभिगमन तिथि 2006-08-02. ↑ "Government of Samoa - Crest". अभिगमन तिथि 2006-08-27. ↑ "Gouvernement du Sénégal - La Constitution : Titre Premier". अभिगमन तिथि 2006-08-27. ↑ "National Constitution of Sierra Leone". अभिगमन तिथि 2006-08-02. ↑ "Embassy of the Republic of South Africa in Washington D.C. - South Africa's Coat of Arms". अभिगमन तिथि 2006-08-27. ↑ अ आ "Spain: Symbols - The national coat of arms". अभिगमन तिथि 2006-08-27. ↑ "Caribbean Community (CARICOM) Secretariat - Suriname". अभिगमन तिथि 2006-08-02. ↑ "Swaziland National Trust Commission - General Swaziland Information: Social". अभिगमन तिथि 2006-08-27. ↑ "Tanzania National website: Country profile". मूल से 2001-03-04 को पुरालेखित. अभिगमन तिथि 2006-08-02. ↑ "Caribbean Community (CARICOM) Secretariat - Trinidad and Tobago". अभिगमन तिथि 2006-08-02. ↑ "Presidency of the Republic of Turkey". अभिगमन तिथि 2007-01-11. ↑ "Wikipedia, Turkey". अभिगमन तिथि 2007-02-09. ↑ "Delegation of the European Commission to Uganda". अभिगमन तिथि 2006-08-27. ↑ "royal.gov.uk - Coats of arms". अभिगमन तिथि 2006-08-27. ↑ "Discover Uruguay". अभिगमन तिथि 2006-10-28. ↑ "संयुक्त राष्ट्र Human Rights Website - Core Document Forming Part of the State Parties - Vanuatu". अभिगमन तिथि 2006-08-27.